A group of Scouse/Chester based climbers have developed a new boulder down at Pigeon’s Cave on the Llandudno Ormes. Ben Farley, along with Matt Donnelly, Simon Peters, and Dave Deary share the honours on the first ascent front. 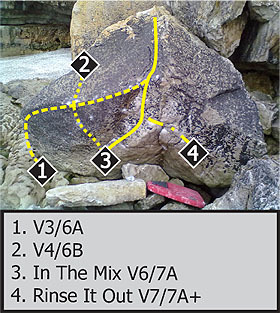 The topo to the right shows all the lines, however Matt Donnelly did climb a further link: Unit 731 V8/7B starts up Rinse It Out, then reverses down In the Mix, before finishing up Problem 2.